Amateur historian Fred Allebach will lead an informative walk of the Mountain Cemetery introducing you to cowboys and Indians, ranchers and real estate tycoons, farmers and farriers, carpenters and stone masons, quarrymen, grocers, butchers, bakers, and maybe even a candlestick maker. This fundraising event is limited to 25 participants. The $35.00 cost per person includes the walking tour and a picnic lunch complete with googly eyes. Proceeds support the Sonoma Overlook Trail Maintenance and Education programs. The Trail is solely supported by private donations. The walk and lunch are sponsored by Sonoma Overlook Trail Stewards. To reserve your spot, contact Rosemarie Marks at eyemdrfm@icloud.com. Oh what a beautiful morning for the Sonoma Overlook Trail! 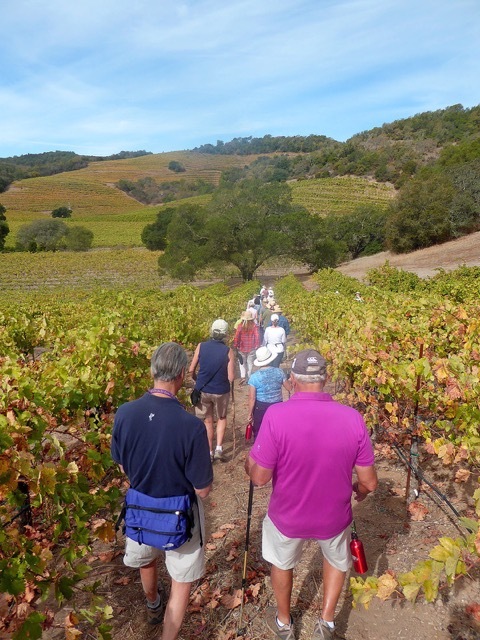 Haywood Winery hosted a very successful Sonoma Overlook Trail fundraiser last Sunday, September 27th. Fall was in the air, the leaves were turning yellow and a kingfisher flew overhead. Thirty four Overlook Trail donors walked the beautiful terraces of vines that are carved into steeply sloping hillsides. The ambitious amongst us reached the 800 foot elevation, while the less ambitious of us sat by the lake enjoying the peace and quiet and reflected colors of the fall leaves. Although the grapes had already been harvested, there were still a few left …. mmmm tasty …the Haywood’s don’t spray for insects and are happy to leave some for the birds…and walkers! 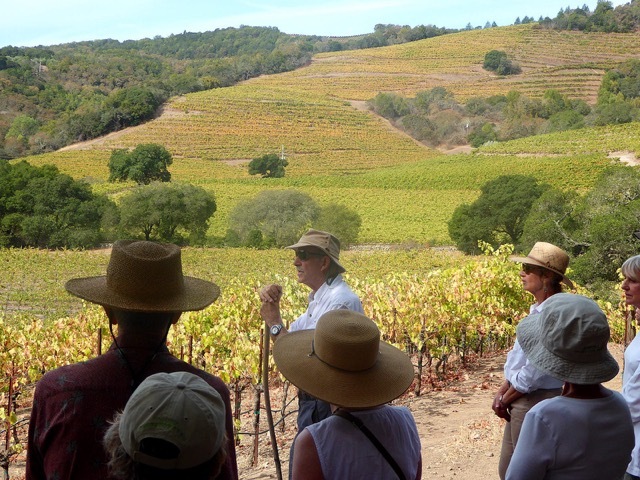 Peter Haywood, renowned winemaker, led us on the ramble and spoke about wine, growing grapes, this year’s harvest and about the people who care for the vines. He is rightly proud of the full time Haywood crew and reflected on how the crew’s feel for the land contributes to making great wine. We returned to the lake together for a refreshing repast donated to us by Sonoma Market, with of course Haywood wines, supplemented with fruit and sweets provided by Hope Nisson, Rosemarie Marks and Laurie Friedeman. 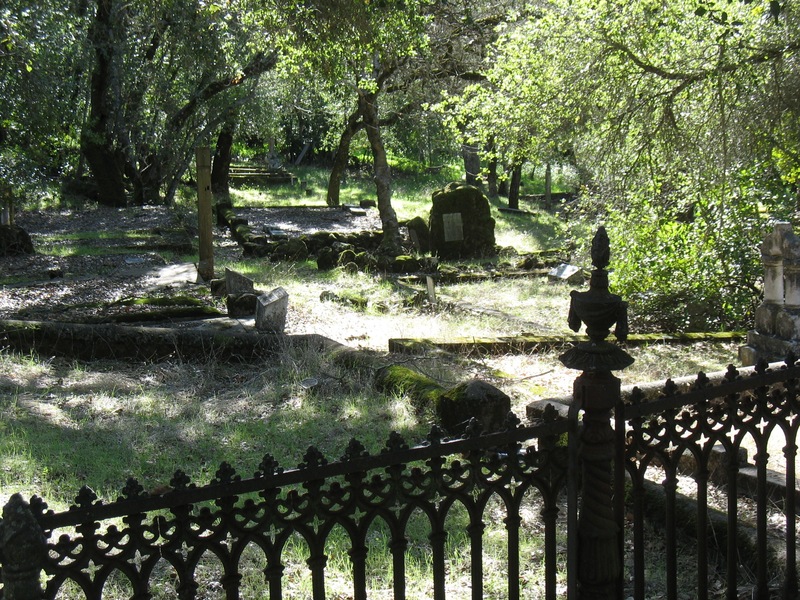 Laurie, fundraising Chair for Overlook Stewards says, if you missed this one, come join us November 1st for our Day of the Dead Mountain Cemetery walk and watch for information about the first ever walk on the 1600 acre Sonoma Raceway property in the Spring. To join our mailing list, e-mail to joannakemper@gmail.com.